CHRISTIANSTED — The Number Two man at the Department of Interior — the federal government agency that has oversight authority over the territories — will arrive in St. Croix this afternoon, the Virgin Islands Free Press has learned. David Bernhardt, Deputy Secretary of the Interior, will be here after first visiting Puerto Rico this morning. 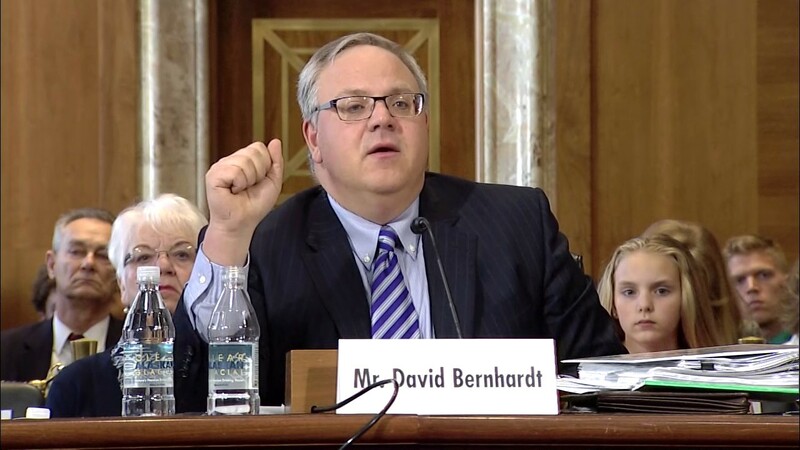 Bernhardt will be trying to independently verify some of the information Gov. Kenneth Mapp presented to the U.S. Congress this week. “Bernhardt will meet with FEMA officials as well as visit Interior offices and properties on the island to gain the latest on-the-ground assessment,” a source close to the Trump Administration told the V.I. Free Press. Meanwhile, Mapp said that the White House sent its third disaster request to Congress on Friday, asking for $44 billion to aid recovery in Texas, Florida, Puerto Rico and the U.S. Virgin Islands. “The request includes $25.2 billion for FEMA and Small Business Administration (SBA) disaster programs, $1.2 billion for emergency agricultural assistance, $1.2 billion for an emergency education fund, and $12 billion for Community Development Block Grant funds for flood mitigation projects,” Mapp said. The White House also announced that it would be sending a fourth major supplemental disaster bill to Congress at the end of the year after additional damage assessments are completed by federal agencies. Mapp has submitted damage recovery estimates to OMB and to the Congress totaling $7.5 billion. The governor’s original assessment of damages done by the storms was only $750,000, but after criticisms from Delegate Stacey Plaskett, he moved the number to $1 billion, then $5 billion — and ultimately — to the current $7.5 billion. Director Mulvaney also affirmed that the Virgin Islands is eligible for funding for all the programs included in the supplemental request, noting that the supplemental request was not the final numbers for any of the affected States or Territories. Director Mulvaney committed that funding for the Virgin Islands and Puerto Rico would also be included in the supplemental disaster bill sent to Congress at the end of the year, after FEMA and the Army Corps of Engineers complete their damage assessments in both territories. Director Mulvaney said that it takes the Federal Government 60 days to assemble initial recovery cost estimates and up to 90 days to verify recovery numbers. He said that the supplemental included money for disaster response and initial recovery activities in Puerto Rico and the Virgin Islands, but, because Hurricane Maria was more recent and federal assessment was ongoing, the additional disaster funding for areas affected by Maria will be included in the next supplemental at the end of the year after the assessments are complete. Mapp praised the Federal commitment to the Virgin Islands and other storm ravaged areas of the United States. “As I testified earlier in the week before the House and Senate hearings on disaster recovery, there is not country on earth that responds to the needs of its citizens better in the aftermath of a natural disaster than the United States,” Mapp said. “I have been given every assurance by the highest officials of our national government that we in the Virgin Islands will be provided all of the resources we need to not only recover, but to build back stronger and better,” said the territory’s chief executive. Mapp has submitted detailed recovery estimates totaling $7.5 billion, which are being reviewed by the relevant federal agencies. He also said that the territory’s disaster assessments are continually being updated by the territory’s engineering and disaster recovery consultants. The chief executive also said that the first tranches of the FEMA Community Disaster Loans were expected to be approved and funds released in the next few days. During his Washington trip, Governor Mapp met with the Congressional Leadership, including Senate Majority Leader Mitch McConnell, Speaker of the House Paul Ryan, House Majority Leader Kevin McCarthy, House Minority Leader Nancy Pelosi and key members of the House and Senate appropriations committees and tax-writing committees. Mapp also commended Plaskett for her efforts to secure Congressional support for the territory’s recovery efforts and her accompanying the Governor on many of his meetings on the Hill. “The Delegate has been doing an excellent job in Washington advocating for our needs in the Territory and working with my recovery team,” Mapp said. Bernhardt’s visit comes after V.I. Republican National Committeeman Jevon Williams was in Washington this week, meeting with administration officials as well as senators and representatives in Congress. Williams pressed the Republican administration of President Trump and Republican congressional majority to increase its due diligence of the territorial government.